The plastics for vinyl fencing can be tinted any color imaginable, and the molds available for vinyl fencing range from simple wooden textures to complex patterns. 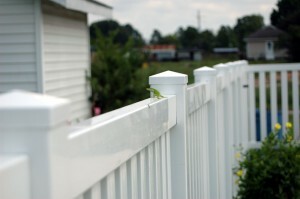 Vinyl fencing comes in a huge variety of styles and colors. Like the white picket fence look? Vinyl fencing can do that. Need a sturdy privacy fence? Vinyl fencing can do that too. The plastics for vinyl fencing can be tinted any color imaginable, and the molds available for vinyl fencing range from simple wooden textures to complex patterns. Vinyl fencing is incredibly strong and incredibly flexible. A vinyl fence can be five times stronger than a wood fence, meaning that it can stand up the beating that children, pets, and backyard sports can inflict on your new fence. Vinyl fences also are more weather-resistant than wooden fences. Wood will warp and crack after too much exposure to strong winds, rain, or snow. Vinyl fencing is non-porous, and therefore doesn’t suffer from water-expansion issues. Because vinyl fencing is a low-maintenance option, it will save your money in the long run. Vinyl fencing doesn’t require specialized tools to clean and maintain it – simple soap and water will take care of all but the most stubborn stains, and a low-power pressure washer can take care of the remainder. Additionally, since vinyl fencing is so durable, it will last far longer than a wood or chain link fence. Vinyl fences sometimes even come with warranties for many years and after they outlive their utility, they can be recycled putting to rest all fears of impending and future ecological danger. This entry was posted on Monday, October 5th, 2015 at 8:02 pm. Both comments and pings are currently closed.